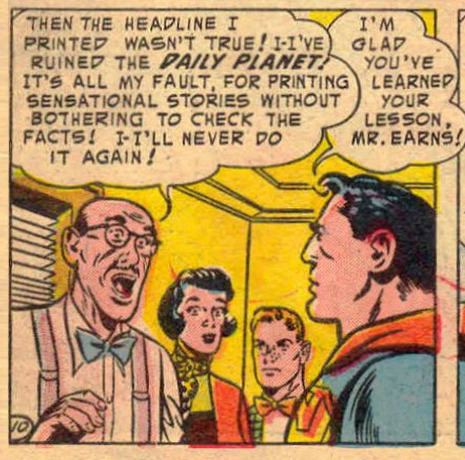 In just the first two panels three preposterous things happen: (1) Daily Planet editor-in-chief Perry White leaves on vacation but doesn’t inform anyone until he’s walking out the door (2) He brings in George Earns as his replacement from outside the newspaper (3) The new temp-editor institutes drastic policy changes to make the paper more sensational. Oh well. Anything to get the ball rolling. When fantastic stories come across the teletype, Earns rushes to print them without any verification. Clark Kent is suspicious and investigates as Superman, discovering the stories are faked. It’s too late to stop The Planet from going to press so Superman uses his powers to actually make the fraudulent stories true, and thereby saving the reputation of his employer. Earns is unconcerned that he rushed to print stories that were actually false at press time, believing it’s his job to keep the readers in a “constant state of excitement”. He probably went onto an illustrious career at Fox News. Oh Lois. Your naive and outdated ethics are charming, but I’m a little concerned about your “feminine curiosity”. 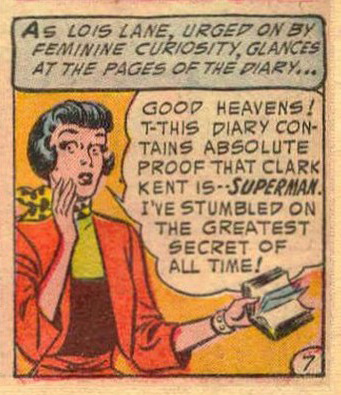 A diary in Clark’s desk seems to prove he’s Superman, but the diary is also fake—another attempt to discredit the paper by getting them to print a spectacular yet false headline. It’s just a coincidence that this time the planted story actually happens to be true! The whole scheme is the work of Jigger Benson, a big crime boss and the subject of a series of articles by Clark Kent. He thinks if he can ruin the Daily Planet’s credibility, no one will believe anything they print about him. 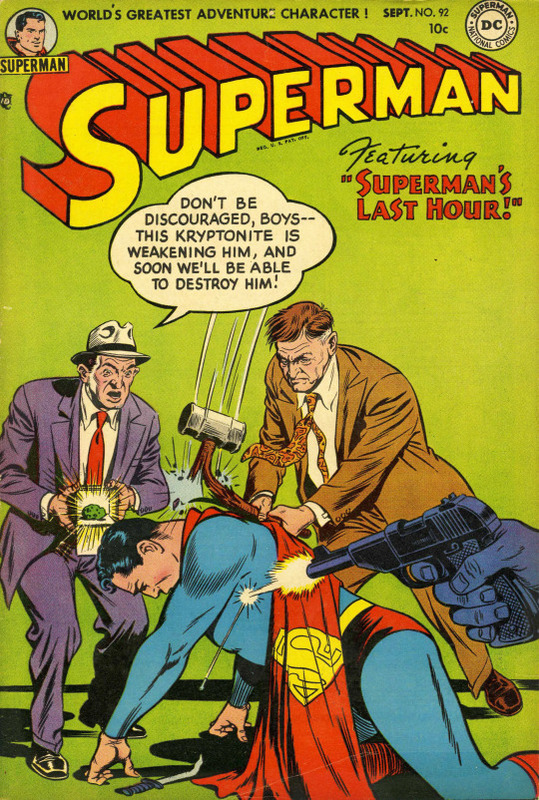 Once the paper announces Superman’s secret identity, Jigger Benson tries to gun down Clark to prove he’s not Superman. But he is Superman so Benson’s plan fails—and Superman’s identity is revealed to the world. Or is it? 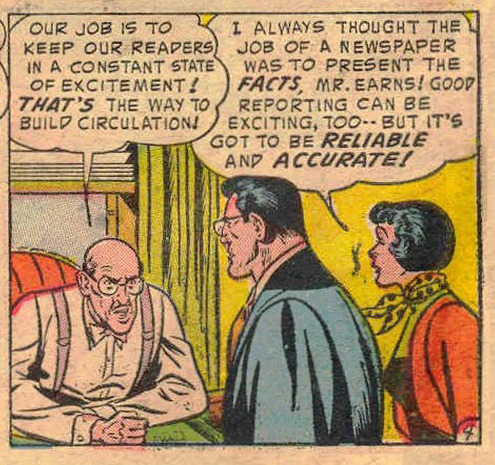 Superman’s explanation is he took Clark’s place while the reporter was secretly hidden away for safekeeping. No one thinks Clark is Superman anymore and our temp-editor has learned his lesson about running stories without verification. So much for Fox News superstardom. Lois Lane finds a picture buried in the heart of a meteor showing Superman being married to an unknown woman. She confronts him demanding an explanation. A famous historian determines the picture was drawn in a small English town 800 years ago. So all this fuss is over a drawing? Everyone is acting like the events portrayed in the picture actually happened. Don’t they realize you can draw a picture of things with no basis in reality? Just look at this comic!! Superman, who has no memory of the woman or wedding, flies “faster than the speed of time” to go back eight centuries to investigate—because what are the chance someone would draw something if it never really happened. The plot gets rather convoluted from here, but Superman participates in a fake wedding where the picture that started this whole mess is drawn. In an attempt to prevent it from turning up in the future he shoves it deep inside a rock—an iron rock which is suddenly sucked up into space by a passing magnetic meteor. 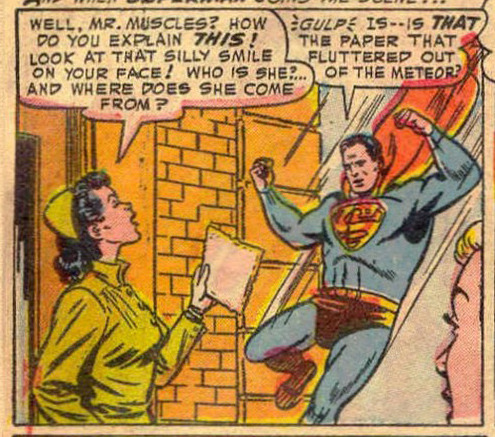 The meteor apparently flew around for 800 years before being discovered by Lois. But if she hadn’t discovered it, Superman wouldn’t have gone back in time and the picture wouldn’t have ended up in the meteor. OK, now do you believe people can draw things that could never happen? Dan Delta, the most feared private detective in Metropolis, bears a striking resemblance to Superman. He also shares Superman’s kryptonite weakness due to a freak atomic accident. Thinking Delta is Superman, a gang of criminals with a chunk of kryptonite hold the detective for ransom—hoping to get a million dollars from the residents of Metropolis for the return of their hero. The real Superman doesn’t want the kidnappers to know they have to wrong guy so he lays low until he can figure out a way to rescue Dan. 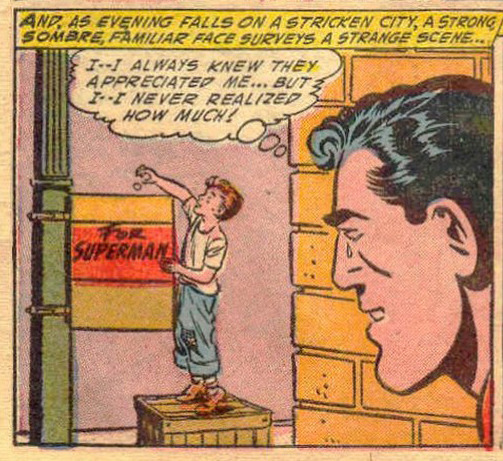 In the meantime, the people of Metropolis pitch in to raise Superman’s ransom, moving the Man of Steel to tears. Well, a tear. In the end, Superman rescues Dan and returns everyone’s money pretty easily. 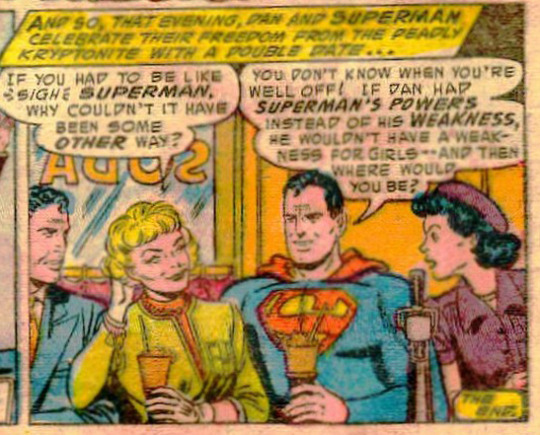 Dan and Supes celebrate by going on a double date where Superman seems to confess his powers prevent him from being attracted to girls—at least that’s what it sounds like to me. FUN FACT: This is the story that established lead could protect Superman from kryptonite’s harmful rays.